We are very lucky to teach in a Victorian building full of character and history but a building this old also requires major renovations to ensure it is fit to carry on into the future. One of the most pressing problems we have had over the past few years is the condition of the roof. We have had leaks on a regular basis that have been patched up but this has now got to the stage when the whole roof requires replacing. After a few false starts, we are now working with Tameside Council and Robertson to replace the whole roof – tiled and flat. A major work such as this is estimated to take up to Christmas (weather permitting) so we’ve set this page up where you can come to find updates on progress. Before any work could start, better access was needed onto the site and so we’ve had new vehicle and pedestrian gates installed where the shelters used to be. This will mean we can remove the existing back gate and ramp when the project is completed, easing the congestion that occurs at the end of the school day. The shelters, which are now stored in the playground, will then go back up where the ramp was. The scaffolders then moved in, erecting the scaffold around the building on the playground side, down by the mobile and along the front path. They will continue until they have covered the whole school. The scaffolding has been padded for safety and also encloses the skip used to collect the old tiles. This has reduced the playground area available, especially down the Infant side of the building. To deal with this, we have set in place staggered break times so that everyone gets the 15 minutes break in the morning – KS1 now have their break 10.15am to 10.30am and KS2 have their break 10.30am to 10.45am. We have managed to keep lunchtime the same as the children eat their lunch at different times over the lunch period. During the 2nd week of term, the roofers were able to start stripping the tiles off the roof and they started down the Infant side of the building. When the roofers are over a classroom, there is a lot of noise from their work but they are able to strip a section above a classroom in 2-3 days. As they move around the building, we will let you know on this page where they are and any updates resulting from their work. Each morning, the skip with all the tiles in from the previous day is removed and replaced with a new skip. On Wednesday, the fully laden skip was moved into the playground and was so heavy, it broke the surface of the tarmac in two places. We cordoned off the area with cones and hazard tape and were informed that the damage would be patched up to allow that area to be used again. Any future damage to the playground will be patched as they go along and then, after the project is completed, the playground will be completely resurfaced. On Wednesday, the roofers moved over Year 5 and, due to the amount of dust that was dislodged through the ceiling, the children were moved out of the classroom. They have been working as a class in the Hall, or in smaller groups in the Suite or mobile. They moved back into their classroom on Monday 8 October. Year 5 moved back into their classroom today as the roofers are no longer directly overhead. The broken tarmac in the playground has been patched over with a temporary, softer tarmac which means that area of the playground can be used again. Due to the weather conditions, the scaffolding around the front entrance to the school has been postponed until the week beginning 15 October. 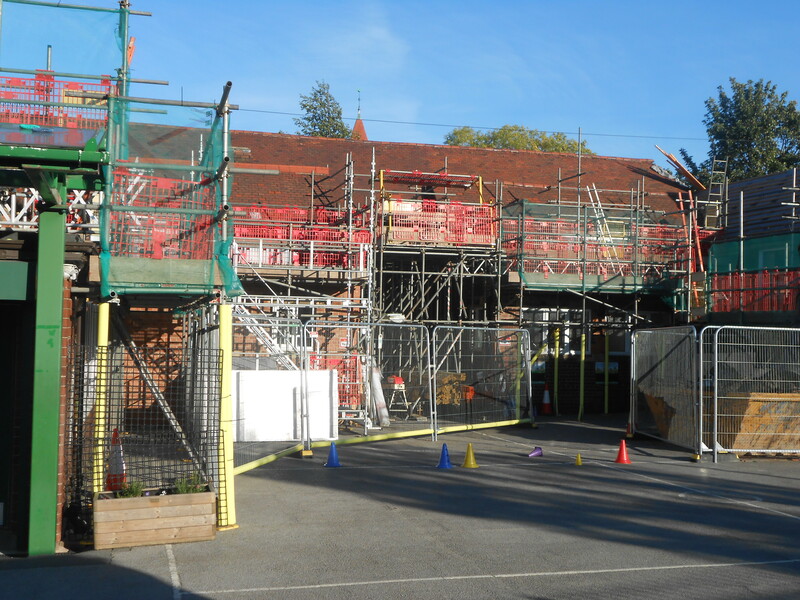 Although there will be access to the front entrance once the scaffold is up, while they are working on it, no-one will be able to come into school through the front door. Pupils and parents will enter the premises through the back gate as normal. It is estimated the front entrance will only be closed for up to a day. If you need to come to school during that time, please ring the office on 0161 336 2956 or 0161 320 7949 so we can let you in through the Reception fire doors. Once the scaffolding is in place, there will be access through a covered walkway to the front door. The scaffolding at the front entrance is now up so the access to the front door is now clear. 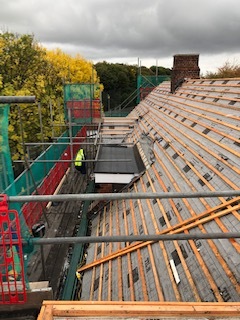 The roofers are making progress and are now over the area of the hall next to Year 5. Although some small holes have appeared in the ceiling as they remove the tiles, the roofers are covering the area as they go so that no debris or rain will get through. The vehicle used to remove the skips every day has caused two more cracks in the playground, which have been patched over. To try to reduce this damage, boards will be laid down for the vehicle to drive onto when they collect the skips. The roofers have started fixing the new tiles to the infant side of the building and are making good progress. 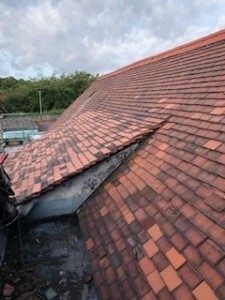 Over the half term break, the roofers will be removing the tiles from the hall roof and should have it all stripped by the time school starts again in November. 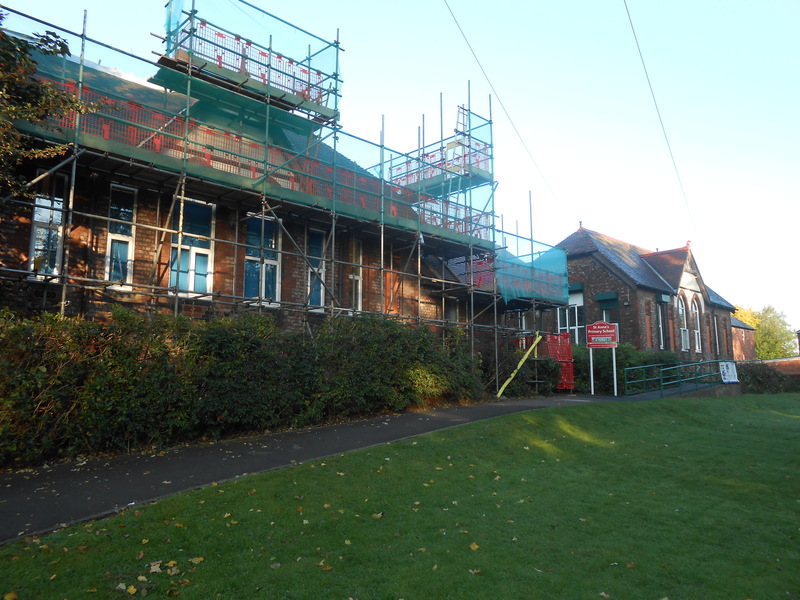 The high level windows are to be replaced due to the change in the level of the new roof and it is planned to replace some of these windows during half term. Remedial work will be carried out to the areas of the playground damaged from the vehicles changing the skips. The area of the playground that was being damaged by the vehicles has been dug out and resurfaced to provide a safer environment. The work on the roof is progressing well with the new tiles already on the KS1 side and work carrying on over the Hall and the KS2 side of the building. We continue to monitor the safety of our pupils and staff during this time and update our procedures on a daily basis. The roofers continue to make good progress. For work that requires access inside school, they are coming in at weekends so they can keep the disruption to a minimum. Over the last weekend, some of the high level windows were replaced to allow for the change in the roof level due to the new insulation. Recently, the roofers moved over the Reception classroom and so the children were moved out to work in other classrooms and the Hall. This lasted for 3 days (Thursday and Friday last week and Monday this week) but they are now back in their classroom. Over the Christmas break, the scaffolding was removed along the KS1 and Reception class playground which has given us back more space to use during break and dinner times. 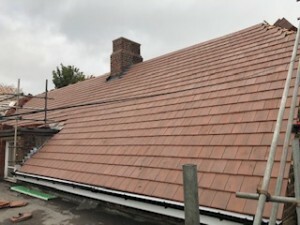 The majority of the tiled roof is now complete and it’s been lovely to hear all the comments we’ve had about how good it looks. The roofers are now concentrating on renovating all the flat roof areas so some of the scaffolding will remain until that has been completed. It could take between 2 to 4 weeks, depending on weather conditions. 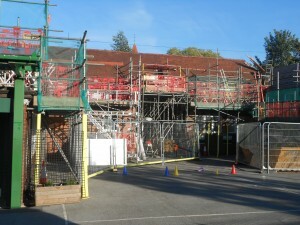 Once the roof has been completed, the playground will be assessed and re-surfaced.